A trust is a three-party fiduciary relationship in which the first party, the trustor or settlor, transfers ("settles") a property (often but not necessarily a sum of money) upon the second party (the trustee) for the benefit of the third party, the beneficiary. A testamentary trust is created by a will and arises after the death of the settlor. An inter vivos trust is created during the settlor's lifetime by a trust instrument. A trust may be revocable or irrevocable; in the United States, a trust is presumed to be irrevocable unless the instrument or will creating it states it is revocable, except in California, Oklahoma and Texas, in which trusts are presumed to be revocable until the instrument or will creating them states they are irrevocable. An irrevocable trust can be "broken" (revoked) only by a judicial proceeding. Trusts and similar relationships have existed since Roman times. The trustee is the legal owner of the property in trust, as fiduciary for the beneficiary or beneficiaries who is/are the equitable owner(s) of the trust property. Trustees thus have a fiduciary duty to manage the trust to the benefit of the equitable owners. They must provide a regular accounting of trust income and expenditures. Trustees may be compensated and be reimbursed their expenses. A court of competent jurisdiction can remove a trustee who breaches his/her fiduciary duty. Some breaches of fiduciary duty can be charged and tried as criminal offences in a court of law. A trust is created by a settlor, who transfers title to some or all of his or her property to a trustee, who then holds title to that property in trust for the benefit of the beneficiaries. The trust is governed by the terms under which it was created. In most jurisdictions, this requires a contractual trust agreement or deed. It is possible for a single individual to assume the role of more than one of these parties, and for multiple individuals to share a single role. For example, in a living trust it is common for the grantor to be both a trustee and a lifetime beneficiary while naming other contingent beneficiaries. Trusts have existed since Roman times and have become one of the most important innovations in property law. Trust law has evolved through court rulings differently in different states, so statements in this article are generalizations; understanding the jurisdiction-specific case law involved is tricky. Some U.S. states are adapting the Uniform Trust Code to codify and harmonize their trust laws, but state-specific variations still remain. An owner placing property into trust turns over part of his or her bundle of rights to the trustee, separating the property's legal ownership and control from its equitable ownership and benefits. This may be done for tax reasons or to control the property and its benefits if the settlor is absent, incapacitated, or deceased. Testamentary trusts may be created in wills, defining how money and property will be handled for children or other beneficiaries. There are strong restrictions regarding a trustee with conflict of interests. Courts can reverse a trustee's actions, order profits returned, and impose other sanctions if they finds a trustee has failed in any of their duties. Such a failure is termed a breach of trust and can leave a neglectful or dishonest trustee with severe liabilities for their failures. It is highly advisable for both settlors and trustees to seek qualified legal counsel prior to entering into a trust agreement. The Lord Chancellor would consider it "unconscionable" that the legal owner could go back on his word and deny the claims of the Crusader (the "true" owner). Therefore, he would find in favour of the returning Crusader. Over time, it became known that the Lord Chancellor's court (the Court of Chancery) would continually recognize the claim of a returning Crusader. The legal owner would hold the land for the benefit of the original owner and would be compelled to convey it back to him when requested. The Crusader was the "beneficiary" and the acquaintance the "trustee". The term "use of land" was coined, and in time developed into what we now know as a trust. The trust is widely considered to be the most innovative contribution of the English legal system. [verification needed] Today, trusts play a significant role in most common law systems, and their success has led some civil law jurisdictions to incorporate trusts into their civil codes. In Curaçao, for example, the trust was enacted into law on 1 January 2012; however, the Curaçao Civil Code only allows express trusts constituted by notarial instrument. France has recently added a similar, Roman-law-based device to its own law with the fiducie, amended in 2009; the fiducie, unlike a trust, is a contractual relationship. Trusts are widely used internationally, especially in countries within the English law sphere of influence, and whilst most civil law jurisdictions do not generally contain the concept of a trust within their legal systems, they do recognise the concept under the Hague Convention on the Law Applicable to Trusts and on their Recognition (partly only the extent that they are parties thereto). The Hague Convention also regulates conflict of trusts. 'As Trustee For' (ATF): This is the legal term used to imply that an entity is acting as a trustee. 'In Its Own Capacity' (IIOC): This term refers to the fact that the trustee is acting on its own behalf. Protector: A protector may be appointed in an express, inter vivos trust, as a person who has some control over the trustee—usually including a power to dismiss the trustee and appoint another. The legal status of a protector is the subject of some debate. No-one doubts that a trustee has fiduciary responsibilities. If a protector also has fiduciary responsibilities, then the courts—if asked by beneficiaries—could order him or her to act in the way the court decrees. However, a protector is unnecessary to the nature of a trust—many trusts can and do operate without one. Also, protectors are comparatively new, while the nature of trusts has been established over hundreds of years. It is therefore thought by some that protectors have fiduciary duties, and by others that they do not. The case law has not yet established this point. The formalities required of a trust depends on the type of trust in question. Generally, a private express trust requires three elements to be certain, which together are known as the "three certainties". These elements were determined in Knight v Knight to be intention, subject matter and objects. The certainty of intention allows the court to ascertain a settlor's true reason for creating the trust. The certainties of subject matter and objects allow the court to administer trust when the trustees fail to do so. The court determines whether there is sufficient certainty by construing the words used in the trust instrument. These words are construed objectively in their "reasonable meaning", within the context of the entire instrument. Despite intention being integral to express trusts, the court will try not to let trusts fail for the lack of certainty. Intention. A mere expression of hope that a trust be created does not constitute an intention to create a trust. Conversely, the existence of terms of art or the word "trust" does not indicate whether an instrument is an express trust. Disputes in this area mainly concerns differentiating gifts from trusts. The trustees administer the affairs attendant to the trust. The trust's affairs may include prudently investing the assets of the trust, accounting for and reporting periodically to the beneficiaries, filing required tax returns and other duties. In some cases dependent upon the trust instrument, the trustees must make discretionary decisions as to whether beneficiaries should receive trust assets for their benefit. A trustee may be held personally liable for problems, although fiduciary liability insurance similar to directors and officers liability insurance can be purchased. For example, a trustee could be liable if assets are not properly invested. In addition, a trustee may be liable to its beneficiaries even where the trust has made a profit but consent has not been given. However, in the United States, similar to directors and officers, an exculpatory clause may minimize liability; although this was previously held to be against public policy, this position has changed. The beneficiaries are beneficial (or 'equitable') owners of the trust property. Either immediately or eventually, the beneficiaries will receive income from the trust property, or they will receive the property itself. The extent of a beneficiary's interest depends on the wording of the trust document. One beneficiary may be entitled to income (for example, interest from a bank account), whereas another may be entitled to the entirety of the trust property when he attains the age of twenty-five years. The settlor has much discretion when creating the trust, subject to some limitations imposed by law. The use of trusts as a means to inherit substantial wealth may be associated with some negative connotations; some beneficiaries who are able to live comfortably from trust proceeds without having to work a job may be jokingly referred to as "trust fund babies" (regardless of age) or "trustafarians". Wills and estate planning: Trusts frequently appear in wills (indeed, technically, the administration of every deceased's estate is a form of trust). Conventional wills typically leave assets to the deceased's spouse (if any), and then to the children equally. If the children are under 18, or under some other age mentioned in the will (21 and 25 are common), a trust must come into existence until the 'contingency age' is reached. The executor of the will is (usually) the trustee, and the children are the beneficiaries. The trustee will have powers to assist the beneficiaries during their minority. Pension plans: typically set up as a trust, with the employer as settlor, and the employees and their dependents as beneficiaries. Remuneration trusts: for the benefit of directors and employees or companies or their families or dependents. This form of trust was developed by Paul Baxendale-Walker and has since gained widespread use. Legal retainer – Lawyers in certain countries often require that a legal retainer be paid upfront and held in trust until such time as the legal work is performed and billed to the client, this serves as a minimum guarantee of remuneration should the client become insolvent. However, strict legal ethical codes apply to the use of legal retainer trusts. Asset-protection trust: The concept of an asset-protection trust encompasses any form of trust that provides for funds to be held on a discretionary basis. Such trusts are set up in an attempt to avoid or mitigate the effects of taxation, divorce and bankruptcy on the beneficiary. Such trusts may be proscribed or limited in their effect by governments and the courts. Dynasty trust (also known as a 'generation-skipping trust'): A type of trust in which assets are passed down to the grantor's grandchildren, not the grantor's children. The children of the grantor never take title to the assets. This allows the grantor to avoid the estate taxes that would apply if the assets were transferred to his or her children first. Generation-skipping trusts can still be used to provide financial benefits to a grantor's children, however, because any income generated by the trust's assets can be made accessible to the grantor's children while still leaving the assets in trust for the grandchildren. Grantor retained annuity trust ('GRAT'): an irrevocable trust whereby a grantor transfers asset(s), as a gift, into a trust and receives an annual payment from the trust for a period of time specified in the trust instrument. At the end of the term, the financial property is transferred (tax-free) to the named beneficiaries. This trust is commonly used in the U.S. to facilitate large financial gifts that are not subject to a 'gift tax'. Hybrid trust: Combines elements of both fixed and discretionary trusts. 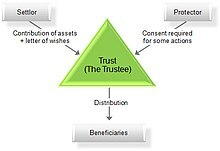 In a hybrid trust, the trustee must pay a certain amount of the trust property to each beneficiary fixed by the settlor. But the trustee has discretion as to how any remaining trust property, once these fixed amounts have been paid out, is to be paid to the beneficiaries. Implied trust: as distinct from an express trust, is created where some of the legal requirements for an express trust are not met, but an intention on behalf of the parties to create a trust can be presumed to exist. A resulting trust may be deemed to be present where a trust instrument is not properly drafted and a portion of the equitable title has not been provided for. In such a case, the law may raise a resulting trust for the benefit of the grantor (the creator of the trust). In other words, the grantor may be deemed to be a beneficiary of the portion of the equitable title that was not properly provided for in the trust document. Improvement trust: can be set up by urban or local government to hold funds for the development or improvement of an area. The trust is often run by a committee, and can act similarly to a development agency, depending on the provisions of its charter. Inter vivos trust (or 'living trust'): A settlor who is living at the time the trust is established creates an inter vivos trust. In the US, a 'protective trust' is a type of trust that was devised for use in estate planning. (In another jurisdiction this might be thought of as one type of asset protection trust.) Often a person, A, wishes to leave property to another person B. A, however, fears that the property might be claimed by creditors before A dies, and that therefore B would receive none of it. A could establish a trust with B as the beneficiary, but then A would not be entitled to use of the property before they died. Protective trusts were developed as a solution to this situation. A would establish a trust with both A and B as beneficiaries, with the trustee instructed to allow A use of the property until they died, and thereafter to allow its use to B. The property is then safe from being claimed by A's creditors, at least so long as the debt was entered into after the trust's establishment. This use of trusts is similar to life estates and remainders, and is frequently used as an alternative to them. In a simple trust the trustee has no active duty beyond conveying the property to the beneficiary at some future time determined by the trust. This is also called a 'bare trust'. All other trusts are special trusts where the trustee has active duties beyond this. Standby Trust (or 'Pourover Trust)': The trust is empty at creation during life and the will transfers the property into the trust at death. This is a statutory trust. Statutory Business Trust: A trust created pursuant to a state's business trust statute used primarily for commercial purposes. Two prominent variants of Statutory Business Trusts are Delaware statutory trusts and Massachusetts business trusts. The Uniform Law Commission promulgated a final amended draft of the Uniform Statutory Entity Act (2009) in 2013. As of 24 January 2017, no states have adopted the Uniform Statutory Entity Act of 2009. Testamentary trust (or 'Will Trust'): A trust created in an individual's will is called a testamentary trust. Because a will can become effective only upon death, a testamentary trust is generally created at or following the date of the settlor's death. Living trusts, as opposed to testamentary (will) trusts, may help a trustor avoid probate. Avoiding probate may save costs and maintain privacy and living trusts have become very popular. Probate is potentially costly, and probate records are available to the public while distribution through a trust is private. Both living trusts and wills can also be used to plan for unforeseen circumstances such as incapacity or disability, by giving discretionary powers to the trustee or executor of the will. Negative aspects of using a living trust as opposed to a will and probate include upfront legal expenses, the expense of trust administration, and a lack of certain safeguards. The cost of the trust may be 1% of the estate per year versus the one-time probate cost of 1 to 4% for probate, which applies whether or not there is a drafted will. Unlike trusts, wills must be signed by two to three witnesses, the number depending on the law of the jurisdiction in which the will is executed. Legal protections that apply to probate but do not automatically apply to trusts include provisions that protect the decedent's assets from mismanagement or embezzlement, such as requirements of bonding, insurance, and itemized accountings of probate assets. Argentinian Legal System, law number 24.441 of 1994. ^ "Trust". BusinessDictionary. WebFinance, Inc. Retrieved 10 August 2017. ^ a b Scott, Austin. "Importance of the Trust". U. Colo. L. Rev. Retrieved 6 April 2014. The greatest and most distinctive achievement performed by Englishmen in the field of jurisprudence is the development from century to century of the trust idea. ^ "Section 2". Restatment of Trusts (Third ed.). St. Paul, Minn.: American Law Institute. 1992. p. 17. ISBN 9780314842466. OCLC 25422858. ^ "Chapter 15". Restatment of Trusts (Third ed.). St. Paul, Minn.: American Law Institute. 1992. p. 67. ISBN 9780314842466. OCLC 25422858. ^ Ben-Barak, Zafrira. "Meribaal and the System of Land Grants in Ancient Israel." Biblica (1981): 73–91. ^ Goode, Roy M. (2 January 1996). Commercial Law (2nd ed.). London, U.K.: Penguin UK. ISBN 0140125345. ^ M. Bergervoet and D.S. Mansur (14 April 2012). "De Curaçaose trust in de partijk" (PDF). Weekblad voor Privaatrecht, Notariaat en Registratie (in Dutch). ^ "Loi n°2007-211 du 19 février 2007 instituant la fiducie". Legifrance.gouv.fr, le service public de la diffusion du droit. 1 February 2009. ^ "Ordonnance n°2009-79 du 22 janvier 2009 (consolidated version)". Legifrance.gouv.fr, le service public de la diffusion du droit. 1 February 2009. ^ a b c d e Hansmann, Henry; Mattei, Ugo (May 1998). "The Functions of Trust Law: A Comparative Legal and Economic Analysis" (PDF). New York University Law Review. Retrieved 17 August 2018. ^ "Database Access – UNSW Library". ^ "Bahr v Nicolay (No 2)  HCA 16; (1988) 164 CLR 604 (15 June 1988)". ^ a b c Glister, James; Lee, James (2015). "Certainty and Capacity". Hanbury and Martin: Modern Equity (20 ed.). Sweet & Maxwell. ISBN 9780414032408. ^ a b McPhail v Doulton ,  UKHL 1. ^ Re Gulbenkian's Settlements Trusts ,  UKHL 5. ^ Re Hay's Settlement Trusts ,  3 All ER 786. ^ Edward Jones Trust Company. Fundamental Duties of a Trustee: A Guide for Trustees in a post-Uniform Trust Code World. ^ "Boardman v Phipps  UKHL 2" (PDF). ^ Last Beneficiary Standing: Identifying the Proper Parties in Breach of Fiduciary Cases. American Bar Association, Section of Real Property, Trust, & Estate Law. 20th Annual Real Property & Estate Planning Symposia. ^ Trust Code Summary. Uniform Law Commission. ^ Schanzenbach MM, Sitkoff RF. (2007). Did Reform of Prudent Trust Investment Laws Change Trust Portfolio Allocation?. Harvard Law School John M. Olin Center for Law, Economics and Business Discussion Paper Series. Paper 580. ^ Martinez, Michael J. (2007). Vault Career Guide to Private Wealth Management. New York, New York: Vault, Inc. p. 18. ISBN 9781581314489. OCLC 86069641. ^ Rosenberg, Scott D. (2009–2010). "Frequently Asked Questions". ^ Kirsh, Harvey J; Roth, Lori A (1 September 1997). "Construction law: Breach of trust in the construction industry". International Finance Law Review (IFLR). ^ Indian Public Administration: Institutions and Issues. New Age International. 1995. pp. 271–272. ISBN 978-81-7328-068-9. Retrieved 2 January 2017. ^ "Bare trusts". HM Revenue & Customs. Retrieved 1 November 2012. ^ "Statutory Trust Entity Act (2009) (Last Amended 2013)". www.uniformlaws.org. Retrieved 2017-01-24. ^ Kam Fan Sin, The Legal Nature of the Unit Trust, Clarendon Press, 1998. ^ "The Dodd–Frank Act: Commentary and Insights" (PDF). Skadden, Arps, Slate, Meagher & Flom LLP & Affiliates. Archived from the original (PDF) on 14 April 2012. ^ Caraway, David (April 2015). "Testamentary Trusts". New York City Bar. Retrieved 14 December 2017. ^ a b Larson, Aaron. "What is a Trust and Why You May Need One". ExpertLaw.com. ExpertLaw. Retrieved 4 May 2017. ^ American Bar Association. Ch.5 Living Trusts. Appears to be online copy of: The American Bar Association guide to wills and estates (1995). See also Ch. 4, Trusts. ^ The formula clause may be: "I leave to my child the maximum allowable amount that is not subject to federal estate tax, with the remainder going to my wife." As of 2013, transfers to spouses are exempt from estate tax. See: After The Fiscal Cliff Deal: Estate And Gift Tax Explained. Forbes. ^ Trust Overview. Moore Stephens Chartered Accountants. ^ Oakley JA. (1996). Trends in Contemporary Trust Law, p. 108. ^ E-book: Trusts for Business Owners, by Peter Carruthers and Robert Velosa. ^ Miller, Winston E. (18 December 2009). "Dump That Trust Through The Window: Family Trust Tax Window". Winston Miller Attorneys.